The Bedford Point, Liberty City branch. 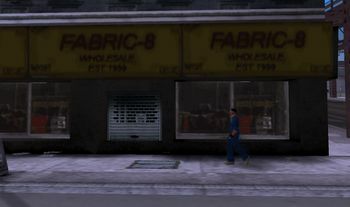 Fabric-8 is a fabric wholesalers in both the Chinatown and Saint Mark's neighbourhoods of Portland and Bedford Point neighbourhood of Staunton Island, Liberty City, and in Downtown, Vice City. The business was established in 1999, despite appearing in Grand Theft Auto: Vice City, which was set thirteen years previous. The name is a reference to the word fabricate. This page was last modified on 11 March 2017, at 14:50.